This advanced report reveals the most comprehensive and objective view of how a business handles its financial obligations. New Risk Dashboard highlights key indicators for faster decision making. Details include fraud check, payment performance, trending and analysis, corporate linkage, public records (federal, state, county), company background information, and financial statements -- all combined to make Premier Profile Report, Experian's flagship! Supply Chain risk management takes skill. You need visibility into all the potential risks that could impact your supplier's ability to successfully deliver on their obligations. This product sheet and User Guile will Facilitate. This fore-runner to the Premier Profile Report contains updated trade payment experiences, Days Beyond Terms (DBT), payment trending, public record information, and company background information. This lower cost report itemizes fundamental business credit statistics, and evaluates all information listed within a model to calculate an easy to use risk score. This score is based on sophisticated techniques that predict the likelihood of a business's payment performance becoming seriously delinquent. This unique report combines predictive credit information on a business with personal credit data on the owner(s) on that business. Experian truly blends the interrelationships of all credit attributes found from both entities into a statistical model that calculates a risk score. This report is ideal on small companies with limited business history or none at all. This detailed report provides a comprehensive picture of the credit history on small business owners – including proprietorships, limited partnerships, and small corporations. Experian Scorex Plus is added to the report for decision support. Scorex Plus has proven to consistently outperform traditional bureau risk scores by accurately classifying risk through customer acquisition and various stages throughout the customer life cycle. Your suppliers are integral to how your business meets demand. A few bad one’s with no back-up can break the supply chain, causing delays, frustration, and send your hard earned customers right out the door with no guaranteed return visit. 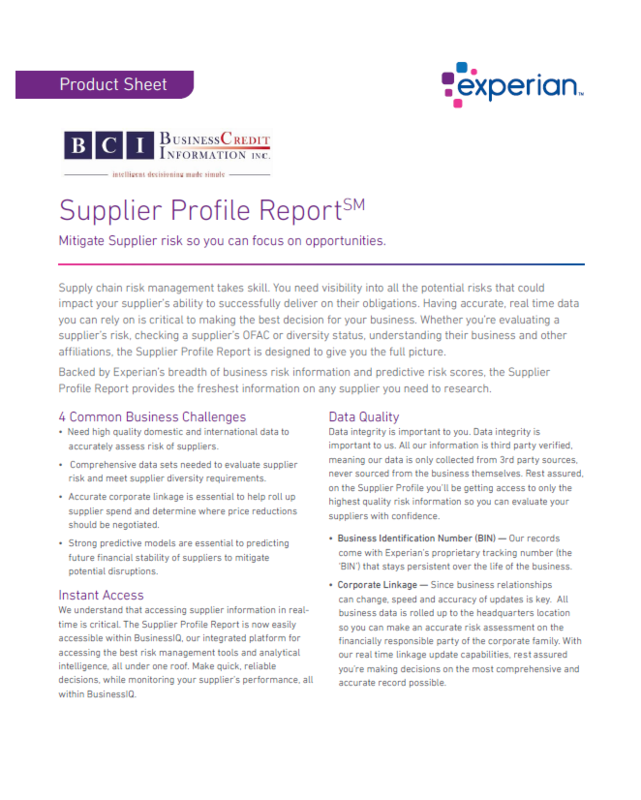 Be in the know with Experian’s brand new Supplier Profile Report to understand your company’s risk exposure, and how to build better supplier relationships..
A low-cost, summarized snapshot of a company's credit record for quick evaluation on low-balance accounts. This one page report classifies credit risk into one of three risk categories. * Combinations of the reports shown above can be ordered simultaneously through Experian BusinessIQ. Experian's new scoring system analyzes businesses on the potential of going bankrupt, or defaulting on obligations. The Financial Stability Risk Score (FSRS) identifies "slow pay" but "will pay" accounts so you can adjust policies accordingly. Experian leverages unique data assets and unparalleled search / match capabilities to provide linkage on the largest corporate entities down to the smallest business. This useful guide helps establish credit limit potential on customers within your industry. Take a closer look at what drives this calculation. Days Beyond Terms (DBT) is the most accurate and current indicator of how a business pays - learn about how Experian's system calculates DBT and how you can put this information to use in your business. Who REALLY can best satisfy your business information needs?